This card is a case from my own card. This time I decided to use Amazing you set and framelits. Take second largest stitched oval and trace inside of it in the center of 4 x 5 1/4” Whisper White card stock. This will give you an idea where to stamp leaves. Now using scrap of whisper white and same oval – die cut for the sentiment. Using the traced oval as a guide, stamp leave part of the flower stamp around with Lemon Lime Twist Ink. Try to ink only the leaves before stamping. Adhere the stamped piece to sweet sugarplum card base. 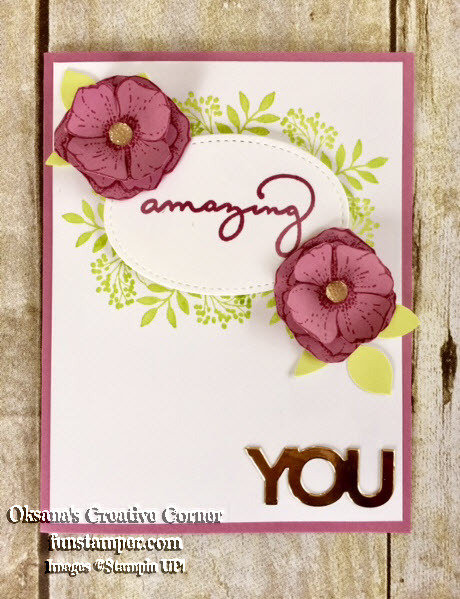 Using sweet sugarplum ink stamp word “amazing” in the center of die cut stitched oval. Add it with dimensionals to the card front over the traced oval. Punch 2 leaves from Lemon lime twist and adhere them to the top left and bottom right sides of the oval. Die cut word “You” from gold foil. Adhere to the bottom right of the card front.